On 26 July 1941, in an attempt to halt Japanese aggression in China, American President Franklin D. Roosevelt issued an executive order which embargoed all oil exports to Japan In August 1941, the Dutch joined the embargo. As a result, Japan lost 93 percent of its oil supply. Japan's reserves included only about a year and a half's oil. During World War II, the Imperial Japanese Navy (IJN) controlled the former Royal Dutch Shell oil fields and refineries in Java. They consisted of two main groups, the Rembang group in Central Java and the Surabaya group in East Java. The oil fields were at Gliron, Kroeka, Lidah, Kawengan, Ledok, Loesi, Nglobo, Semanggi and Tremboel. The crude oil was pumped from the fields through miles of pipelines to Bataafse Petroleum Maatschappij (later Shell) refineries at Wonokromo, Kapoean and Tjepoe (Cepu). The captured BPM facilities were operated by Japanese civilian and local national technicians. Surabaya, located on the eastern part of Java Island was the main Dutch naval base in the Netherlands East Indies. Surabaya's facilities included a harbor, a shipping port, submarine base with workshops, barracks, cranes and concrete docks, seaplane base, radio station, underground fuel tanks and small dry docks. Nearby Morokrembangan, a former Dutch Army airfield, was used by MLD landplanes. On 3 February 1942, Japanese bombers made their first air strike on Surabaya. Shore facilities were hit and moored Dutch Dornier flying boats were strafed and sunk. In the following days, the port and airfield received almost daily attacks and more aircraft were lost. 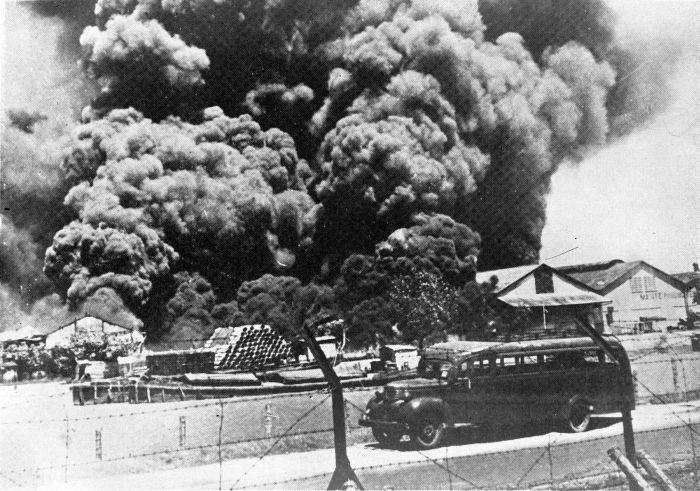 On 19 February, after the Japanese seized the airfields in southern Sumatra and Bali Island, the attacks on Surabaya increased. At sea, as a large Japanese invasion convoy approached Surabaya, the American, British, Dutch and Australian (ABDACOM) Naval Strike Force led by Dutch Rear Admiral Karel W. F. M. Doorman's (former CO of CL SUMATRA) consisting of light cruiser Hr.Ms. DE RUYTER, cruisers HMS EXETER, USS HOUSTON (CA-30), light cruisers HMAS PERTH, Hr.Ms. JAVA, destroyers HMS ELECTRA, ENCOUNTER, JUPITER, Hr.Ms. KORTENAER and old destroyers USS ALDEN (DD-211), JOHN D. EDWARDS (DD-216), JOHN D. FORD (DD-228) and PAUL JONES (DD-230) engaged IJN CruDiv 5's NACHI and HAGURO, DesRon 2's light cruiser JINTSU, DesDivs 7 and 16's eight destroyers and DesRon 4's light cruiser NAKA and six destroyers. During the next two days, between 27 February and 1 March 1942, the disastrous Battle of the Java Sea, was fought in which IJN surface units, aircraft and mines sank DE RUYTER, JAVA, KORTENAER, HOUSTON, PERTH and the EXETER and the destroyers KORTENAER, JUPITER, ELECTRA, ENCOUNTER, EVERTSEN and USS POPE (DD-225). Two damaged Dutch destroyers, WITTE de WITH and BANCKERT remained at Surabaya, but were bombed and put out of action a few days later. On 1 March 1942, the Japanese invasion force landed at the village of Kragan, East Java, about 100 miles west of Surabaya. The invasion force consisted of MajGen Tsuchihashi Yuitsu's 48th Division and MajGen Sakaguchi Shizuo’s detachment of the 156 Mixed Infantry Brigade. Colonel Tanaka Tohru’s unit of the 48th Division was ordered to occupy Tjepoe (Cepu) and secure its oil fields while LtCol Kitamura Kuro’s unit was to occupy Bodjonegoro, near Tjepoe. The whole unit planned a two-pronged attack on Surabaya from the west through Lamongan and from south through Djombang and Modjokerto. The Tanaka Unit occupied Tjepoe on 2 March, while the Kitamura Unit occupied Bodjonegoro on 3 March. At 0900, 8 March, the C-in-C of the Allied forces, Dutch LtGen Hein Ter Poorten announced the surrender of the Royal Netherlands East Indies Army in Java. That afternoon, Governor Jonkheer Dr. A.W.L. Tjarda Van Starkenborgh Stachouwer and Ter Poorten met the C-in-C of the Japanese forces LtGen Hitoshi Imamura at Kalidjati, Java and agreed to capitulate. That same afternoon, MajGen Tsuchihashi ordered his 48th division to attack and occupy Surabaya which was accomplished by 1800. The next day, the commander of Dutch forces in East Java also surrendered. On 10 March 1942, the 21st Special Base Force of Vice Admiral Takahashi Ibo’s (36)(former CO of KIRISHIMA) 2nd Southern Expeditionary Fleet’s was organized at Surabaya and included the 21st Guard Unit, 21st Signals Unit, 21st Submarine Unit, 91st Subchaser Division 1’s CH-1, CH-2 and CH-3, MineSweepDiv 1’s W-1, W-2 and W-3 and minelayers SHIRATAKA and TATSUMIYA MARU. Thereafter, the subchasers and minesweepers escorted convoys between Surabaya, Kendari and Makassar, Celebes and other points. Later, the 103th, 108th, 109th and 113th AA Defense Units also became part of the 21st Special Base Force at Surabaya. That same day, seaplane tender IJN SANYO MARU was assigned to the 2nd Southern Expeditionary Fleet. Later, SANYO MARU supported operations in the Burma-Andaman area. In April 1942, the 33rd Kokutai (Naval Air Group) moved from Makassar, Celebes (Sulawasei) to the 21st Special Base Force at Surabaya with eight Aichi Type 99 D3A "Val" dive-bombers and eight Nakajima Type 97 D3A "Kate" torpedo-bombers. On 28 April 1942, heavy cruiser IJN ASHIGARA, flagship of the Southwest Area Fleet, arrived at Surabaya. Between 8-16 May 1942, IJN SANYO MARU departed Surabaya escorted by subchaser CH-20 to participate in Operation "S" – the Seizure of the Lesser Sunda Ialands. She provided air support of a combined Army/Navy Operation that included Lombok, Sumbawa, Flores and Bali Islands. At 0900, 8 May 1942, minelayer IJN SHINKO MARU and IJA transport SHINGU MARU escorted by subchasers CH-6 and CH-19 departed Surabaya for Lombok Island carrying Rear Admiral (later Vive Admiral) Hara Kenzaburo’s (37)(forner CO TAKAO) Lesser Sunda Islands Invasion Force consisting of an Army Landing Force (ALF) and elements of the 3rd Battalion, 47th Infantry Regiment. No Dutch resistance was encountered. Between 27-30 July 1942, IJN SANYO MARU departed Surabaya escorted by subchaser CH-20 and provided air support for Operation “T” – the Seizure of the Tanimbar Islands. CruDiv 16’s light cruiser IZUSU and torpedo boat TOMORZURU also provided support for landing operations. SANYO MARU lost one Mitsubishi F1M2 “Pete” to ground fire. On 30 September 1942, IJN ASHIGARA departed Surabaya on a troop transport run to Shortland, Bougainville via Davao, Philippines and Rabaul, New Britain and arrived 9 October. Disembarked troops who later reinforced Guadalcanal and departed. On 20 October, she arrived back at Surabaya via Palau. On 30 October 1942, refloated tanker TOEN MARU (ex-British AUNGBAN sunk at Hong Kong) departed Surabaya for Ambon, Moluccas, arriving 6 November and returned to Surabaya on 10 November. On 22 November 1942, 10,009-ton tanker IJN TATEKAWA MARU arrives at Surabaya from Truk, loads fuel and on 26 November departedfor Balikpapan. On 18 December 1942, 10,216-ton tanker IJN OGURA MARU No. 2 arrived at Surabaya from Balikpapan and probably discharged oil. On 23 December, she departed for Balikpapan arriving there 25 December. At Balikpapan, she loaded 4,000 tons of crude oil and departed 28 December for Surabaya arriving there 31 December. On 30 December 1942, refloated tanker IJN ENOSHIMA MARU (ex-British RFA EBONOL scuttled at Hong Kong) arrived at Surabaya fresh from repairs and refurbishment Sasebo. She departed and arrived at Balikpapan, Borneo on 7 January 1943 and probably loaded crude. On 13 January, she arrived back at Surabaya, probably discharged oil and departed for Balikpapan. ENOSHIMA MARU followed this routine almost weekly until the end of the war. From 7 January to 1 April 1943, IJN ASHIGARA resumed guardship duties at Surabaya after arriving back from docking at Seletar Naval Base, Singapore. On 6 February 1943, IJN TOEN MARU (ex-British AUNGBAN) departed Surabaya for Kau Bay, Halmahera, Moluccas returning to Surabaya on 19 February. On 1 March, she departed Surabaya, but the next day was torpedoed and sunk by LtCdr (later KIA) William J. Millican’s USS THRESHER (SS-200) in the Makassar Strait at 03-29S, 117-17E. On 19 March 1943, tanker IJN AKATSUKI MARU arrived at Surabaya from Kure On 23 March, she departed for Balikpapan, Borneo escorted by subchaser CH-2 arriving 28 March. On 30 March she departed and arrived back at Surabaya on 1 April 1943. On 4 April, at 1100, she departed Surabaya for Balikpapan arriving 1300, 6 April. On 27 May 1943, fleet oiler IJN TSURUMI arrived at Surabaya, loaded fuel and departs for Balikpapan escorted by subchaser CH-2 arriving 0900, 8 June. On 9 October 1943, at about 1100, LtCdr Marvin J. Jensen's USS PUFFER (SS-268) torpedoes and damaged auxiliary tanker IJN KUMAGAWA MARU (former NICHIYO MARU) in the Makassar Strait, off Balikpapan at 01-07N, 119-30E. At 1530, 11 October 1943, small tanker KINREI MARU arrived at Surabaya from Rembang, Java, entered drydock and underwent repairs, departing on 9 November for Ambon and arriving there 15 November. At 1800, 13 October 1943, 10,018-ton tanker IJN NICHIEI MARU arrived at Surabaya. At 1452, she departed for Balikpapan in a convoy consisting of oiler KENYO MARUs escorted by patrol boat No. 102 (ex-USS STEWART, DD-224). On 17 October 1943, 1TM Standard Tanker IJN JAMBI MARU arrived at Surabaya from Palembang, Sumatra. On 21 October, she departed for Singapore arriving there 25 October. On 15 December 1943, transport ENOSHIMA MARU towed IJN KUMAGAWA MARU, torpedoed two months earlier, from Balikpapan to Surabaya arriving the next day where she underwent lengthy battle-damage repairs. On 24 December 1943, 9,527-ton tanker IJN FUJISAN MARU departed Surabaya for Balikpapan to load aviation fuel for Rabaul. On 22 January 1944, 10,526-ton tanker IJN NISSHO MARU arrived at Surabaya from Truk via Palau after having been bombed and damaged on 4 Nov ’43 AirSols B-24 aircraft based at Guadalcanal. NISSHO MARU was drydocked and underwent repairs by the IJN's No. 103 Repair Facility until 15 February when she was undocked and departed for Balikpapan to take on a cargo of crude oil. In February 1944, UIT-25, former Italian submarine LUIGI TORELLI, handed over to the Germans on 10 Sep '43 after the Italians surrendered, was put into service on supply runs between Surabaya, Penang and Kobe. On 9 February 1944 fleet oiler TSURUMI arrived at Surabaya with a convoy consisting of tanker KYOEI MARUs and cargo ship NAGISAN MARU escorted by auxiliary subchasers CHa-36, CHa-37 and CHa-41. At 1200, 12 February TSURUMI departed for a battleship anchorage near Aru Bank escorted part-way by minesweeper W-11. On 22 February 1944, convoy No. 131 arrived at Surabaya from Moj via Takao, Singapore and Jakarta that consisted of ARABIA, TOTTORI and USSURI MARUs and seven unidentified ships escorted by subchasers CH-41 and CH-43. ARABIA MARU carried elements of the IJA 147th Infantry Regiment, 46th Division including regimental HQ, 1st, 3rd and artillery battalions. USSURI MARU carried the 2nd Battalion. 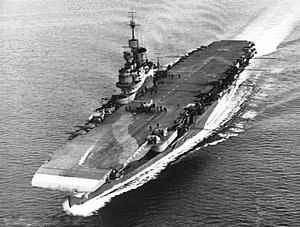 On 6 May 1944, Admiral (later Admiral of the Fleet, Sir) James F. Somerville’s (former CO of HMS NORFOLK) British Task Force 65 departed Trincomalee, Ceylon (Sri Lanka) consisting of battleships HMS QUEEN ELIZABETH, HMS VALIANT and Free French RICHELIEU, cruisers HMS NEWCASTLE, HMS NIGERIA and Dutch Hr.Ms. TROMP and destroyers HMS ROTTERHAM, HMS RACEHORSE, HMS PENN, HMS PETARD, Dutch Hr.Ms. VAN GALEN, HMAS NAPIER, HMAS NEPAL, HMAS QUIBERON and HMAS QUICKMATCH. On 7 May 1944, Somerville’s Task Force 65 was joined by Vice Admiral (later Admiral of the Fleet/Sir) Arthur J. Power's Task Force 66 from Columboe, Ceylon consisting of carriers HMS ILLUSTRIOUS and USS SARATOGA (CV-3), battlecruiser HMS RENOWN, cruisers HMS CEYLON and HMNZS GAMBIA and destroyers HMS QUILLIAM, HMS QUADRANT, HMS QUEENBOROUGH, USS CUMMINGS (DD-365), USS DUNLAP (DD-384) and USS FANNING (DD-385). On 15 May 1944, at Exmouth Bay, Western Australia, the combined Task Force refueled from Task Force 67 consisting of six fleet tankers and a water tanker escorted by cruisers HMS LONDON and HMS SUFFOLK. On 17 May 1944, Admiral Somerville launched Operation "TRANSOM". 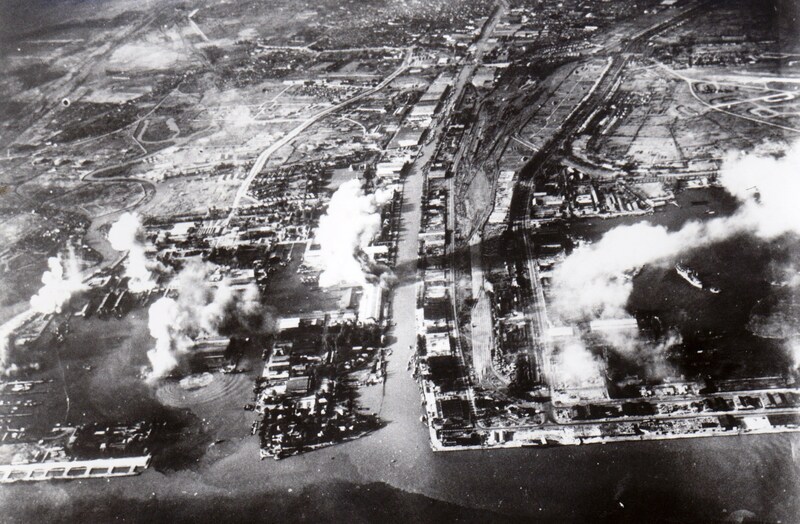 Forty-five Grumman “Avenger” torpedo-bombers and Douglas "Dauntless" dive-bombers escorted by 40 Grumman “Hellcats” and Chance-Vought “Corsair” fighers attacked the Wonokromo refinery and nearby harbor facilities and shipping at Surabaya. ILLUSTRIOUS' planes sank transport SHINREI MARU and SARATOGA's damaged auxiliary subchasers CHa-107 and CHa-108, cargo ships CHUKA and TENCHO MARUs and IJN tanker YOSEI MARU (ex-Dutch JOSEFINA). While undergoing repairs in No. 2 dock, patrol boat PB-36 was hit by a bomb from SARATOGA’s planes that caused heavy damage and killed eight men. Twelve Japanese aircraft were destroyed on the ground. One of SARATOGA's TBM-1C Avenger torpedo bombers, flown by VT-12’s CO Lt William E. Rowbotham, was lost. His crew was last seen in a rubber dinghy outside the harbor and were declared MIA. Bataafse Petroleum Maatschappij (later Shell) Refinery at Wonokromo Under Attack During Operation "TRANSOM"
That same night, seven USAAF 5th Air Force B-24 "Liberator' heavy bombers of the 380th Bombardment Group (H) based at the secret Royal Australian Air Force (RAAF) at Corunna Downs Airfield, in the Pilbara, north of Perth, Western Australia made a follow-up attack on Surabaya Harbor. 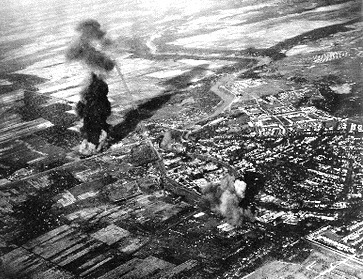 The 380th's bombing mission to Surabaya was as long as the 1943 Ploesti, Romania bombing mission by B-24s from Benghazi, Libya (Operation "Tidal Wave"). On 18 May 1944, USS SARATOGA and destroyers USS CUMMINGS, DUNLAP and FANNING were relieved and ordered back to Pearl. Harbor via Sydney, Australia. SARATOGA passed down the columns of the Eastern Fleet as the Allied ships rendered honors to and cheered each other. Free French Battleship RICHELIEU seen from USS SARATOGA as the carrier and her escorts were detached for Pearl. On 27 May 1944, Somerville's combined Task Force arrived back at Ceylon. On 10 June 1944, USS SARATOGA's TG 58.4 arrived at Pearl Harbor, Hawaii. At 1300, 26 June 1944, small tanker HISHI MARU No. 2 departed Surabaya for Kotabaru, Borneo in a also convoy consisting of tankers ENOSHIMA and YOSEI MARUs, cargo TAI MARU and TORA MARU No. 1 escorted by minesweeper W-11. In November 1944, incessant Allied air and submarine attacks rendered Penang untenable as an operational base for submarines. 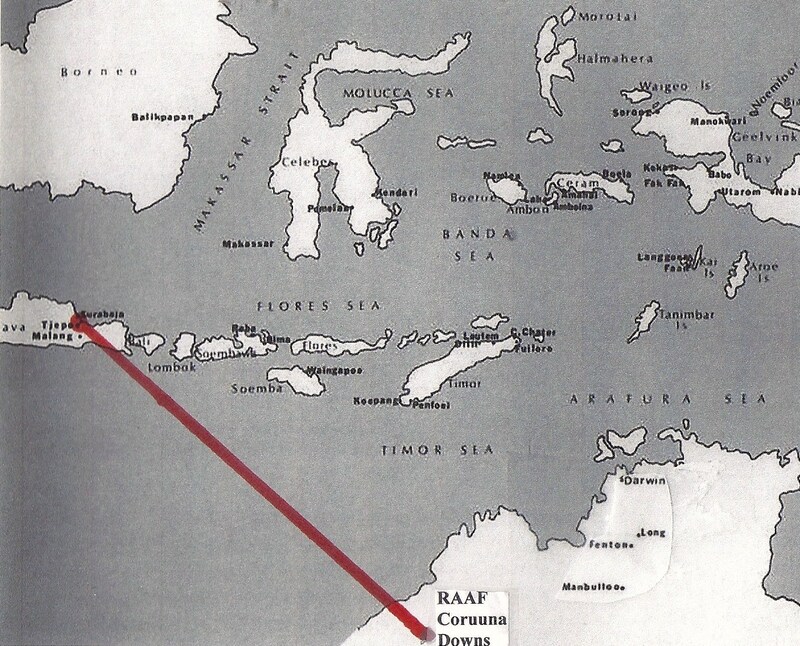 The Japanese I-boats relocated to Surabaya and the German U-boats withdrew to Batavia (Jakarta), Java. On 5 May 1945, the commander of the U-boat base at Surabaya announced Hitler was dead and Germany had ceased hostilities in the West. U-195 was then boarded by the Japanese and the rising sun ensign hoisted. On 15 July, she was commissioned as IJN I-506, then overhauled by the No. 102 Repair Unit and assigned to the 2nd Southern Expeditionary Fleet, but since no Japanese crew was assigned to her, I-506 never left her moorings. On 2 September 1945, after the Japanese signed the Instrument of Surrender aboard USS MISSOURI (BB-63), the Japanese Army and Navy issued General Order No. 1, that ordered "all military commanders both within Japan and abroad to completely disarm Japanese forces and other military forces under Japanese command, regardless of their location ... and to surrender all weapons and equipment …"
On 21 September 1945, in Surabaya, advance officer Royal Dutch Navy Captain P. J. G. Huijer took the surrender of Vice Admiral Shibata Yaichiro's (40)(former CO SUZUYA) 2nd Southern Expeditionary Fleet and MajGen Iwabe Shigeo's Mixed Defense Brigade. Captain Huijer thought most Indonesians still would be obedient to the Dutch. He did not know that the Indonesians' attitude had changed during the Japanese occupation. Shibata and Iwabe ordered their soldiers to hand over all arms to the Indonesians without resisting. The Indonesians obtained 26,000 rifles, 600 machine guns, cannons, anti-aircraft guns and other weapons. Thus, the soon-to-be established revolutionary Indonesian Army became an armed military force.